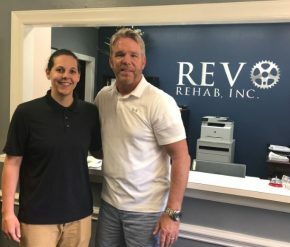 Catawba Regional was able to assist Ashley Fann and Scott Sherrill (pictured at left), principals of REVO Management, LLC, with an RLF (Revolving Loan Fund) loan to finance the acquisition of commercial real estate, and to purchase equipment for the facility located in Rock Hill, SC. South State Bank provided first mortgage financing for this project. The practice provides physical therapy and related services to customers in Rock Hill and the surrounding regional area. Five (5) jobs will be retained and two (2) jobs will be created as a result of this project.